Sound, an organization of 13 petroleum industry companies. The North Sounder will be based in Bellingham, Wash. The 73-foot vessel joins a fleet of smaller skimmers, auxiliary boats, and barges Clean Sound has stationed at ports through- out Puget Sound. Coast Guard buoy tender. When operating in its oil-spill recovery mode, the vessel's bow opens to reveal an escalator-like ramp leading from under the water surface and into the mid-hull area of the boat. Sound can plan for recovery of spilled oil in our state's offshore waters," Mr. Wiechert noted. North Sounder. The most signif- icant is an improved method of recovering oily debris. The debris catching and handling system was designed to cope with ma- terials such as logs, branches, kelp, eel grass, and other floating debris. JBF's oil recovery system uti- lizes the natural propensity of oil to float on water that "forces" a mechanical separation of sur- face oil from the water. A dy- namic inclined plane (DIP) in the bow of the vessel forces oil- coated water into a collection well in the vessel's hull under the surface level. The DIP's mov- ing belt pushes the oil lower than its natural level, gravity then separates it, and the oil wells-up inside the vessel into a collection tank. Recovered oil is continuously pumped from the collection tank area to onboard holding tanks or by flexible hose to a trailing oil barge. Mass. 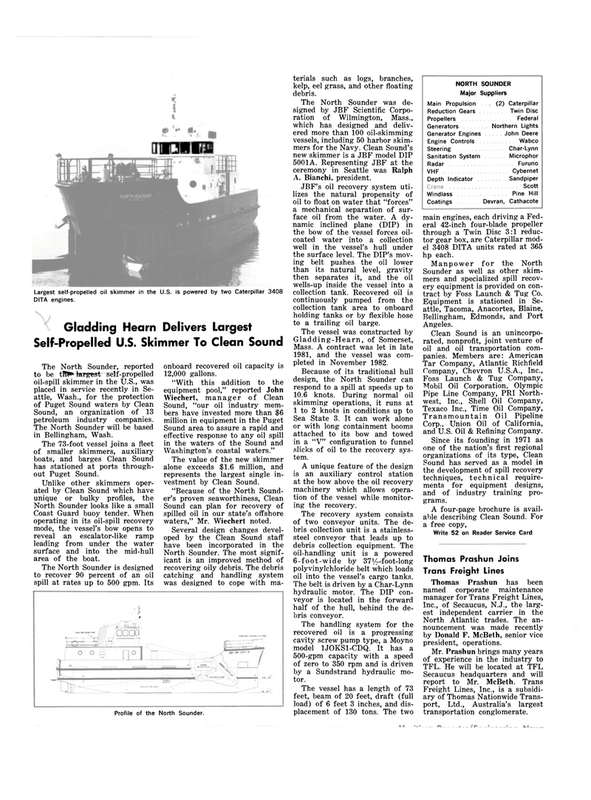 A contract was let in late 1981, and the vessel was com- pleted in November 1982. Sea State 3. It can work alone or with long containment booms attached to its bow and towed in a "V" configuration to funnel slicks of oil to the recovery sys- tem. A unique feature of the design is an auxiliary control station at the bow above the oil recovery machinery which allows opera- tion of the vessel while monitor- ing the recovery. The recovery system consists of two conveyor units. The de- bris collection unit is a stainless- steel conveyor that leads up to debris collection equipment. The oil-handling unit is a powered 6-foot-wide by 371/;>-foot-long polyvinylchloride belt which loads oil into the vessel's cargo tanks. The belt is driven by a Char-Lynn hydraulic motor. The DIP con- veyor is located in the forward half of the hull, behind the de- bris conveyor. The handling system for the recovered oil is a progressing cavity screw pump type, a Moyno model 1JOKS1-CDQ. It has a 500-gpm capacity with a speed of zero to 350 rpm and is driven by a Sundstrand hydraulic mo- tor. Coatings Devran, Cathacote main engines, each driving a Fed- eral 42-inch four-blade propeller through a Twin Disc 3:1 reduc- tor gear box, are Caterpillar mod- el 3408 DITA units rated at 365 hp each. Sounder as well as other skim- mers and specialized spill recov- ery equipment is provided on con- tract by Foss Launch & Tug Co.
Corp., Union Oil of California, and U.S. Oil & Refining Company. Sound has served as a model in the development of spill recovery techniques, technical require- ments for equipment designs, and of industry training pro- grams. North Atlantic trades. The an- nouncement was made recently by Donald F. McBeth, senior vice president, operations. Freight Lines, Inc., is a subsidi- ary of Thomas Nationwide Trans- port, Ltd., Australia's largest transportation conglomerate.